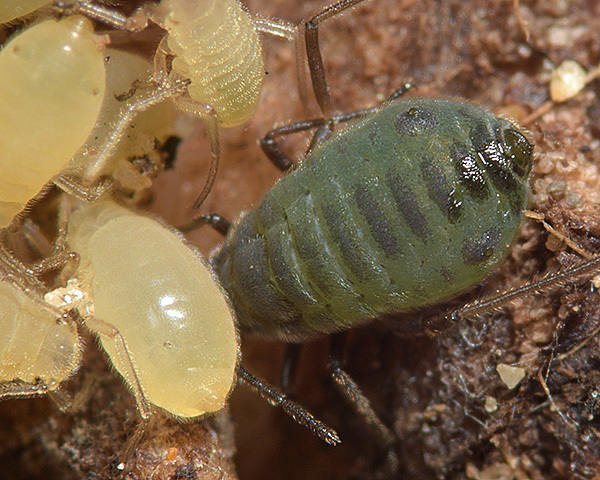 Protrama are medium to large aphids. The apterae are normally alatiform, with dark dorsal cross bands. The eyes are large and the antennae are about half the body length. The hind tarsus is 0.5-0.9 times as long as the hind tibia. Siphuncular cones are present and are dark, low and hairy. The cauda is rounded. Protrama feed on underground parts of members of the daisy family, Asteraceae, (especially thistles and wormwoods), or of the buttercup family, Ranunculaceae. Heie (2009) points out that amongst the Lachnini, members of the genera Protrama, Neotrama and Trama are the only ones that do not live on trees as their only host. He poses the questions "What was the original primary host of these species? ... Or did their ancestor conquer herbs as its only host in one step?" Adult apterae of Protrama radicis are dirty-white to pale-yellow or pale brownish-green. Each segment of the dorsum has a transverse dark sclerotized bar (cf. Trama species which have no dark bars on the dorsum of the aptera). The head and appendages are dark. The antennal terminal process of Protrama radicis is 0.33-0.69 times the length of the base of the sixth antennal segment. The hind tarsus is 0.72-0.87 times the length of the hind tibia (cf. Protrama flavescens where the hind tarsus is only 0.59-0.70 times as long as the hind tibia). Siphunculi are present as pores placed on small brown cones. 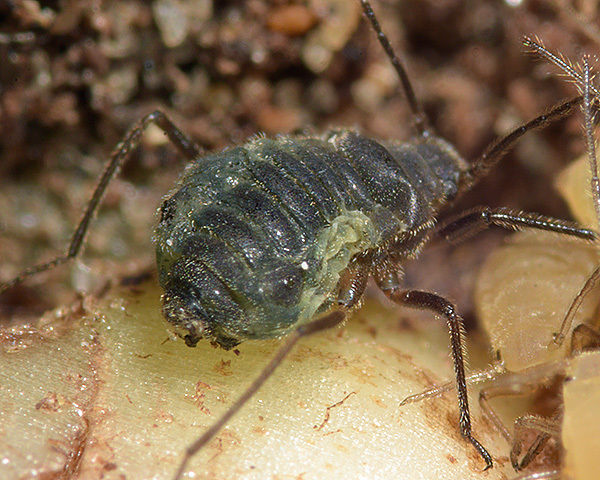 The body length of the adult aptera is 2.5-3.4 mm. The immatures are yellow brown with small siphuncular pores and resemble the immatures of Trama species. Alate Protrama radicis have never been found - only apterae and alatiform apterae are known. Protrama radicis lives in ant attended colonies on the roots of various Asteraceae, especially thistles (Cirsium and Carduus) but also Arctium, Centaurea, and Cynara. They feed on the roots close to the soil surface. They reproduce parthenogenetically throughout the year, and no sexual morphs have been found.